Figure 1 from page 6 of guidance note. The NAP process: Key elements requiring finance. Click to enlarge. Significant financing is needed throughout the entire National Adaptation Plan (NAP) process, but especially within its implementation phase. In order to achieve the adaptation ambitions countries set out through their NAP process, most countries will need to combine a range of potential sources of finance—private and public, international and domestic. This guidance note aims to assist countries with determining how to secure the financing for their NAP processes. Financing is needed throughout the entire NAP process to enable its potential to be reached—from its initiation to the implementation, monitoring and evaluation of prioritized adaptation actions. *Download the guidance note from the right-hand column. For details of references see the guidance note. To learn more about national adaptation planning related to climate change, browse the National Adaptation Planning theme page. Many developing countries are demonstrating their commitment to preparing for and adapting to the impacts of climate change by initiating national adaptation plan (NAP) processes. Concurrently, most have also included an adaptation component in their nationally determined contributions (NDCs) to fulfilment of the purpose of the Paris Agreement. These initiatives can be complementary and reinforcing. NDCs enable countries to share their adaptation goals, objectives, priorities and actions with the international community, while NAP processes provide a concrete means for successful achievement of these initiatives. Provide a clear understanding of the NAP process from a financing perspective. Present the range of potential sources of finance and identify which sources may be more appropriate for different phases of the NAP process. Suggest practical steps that countries might take throughout the NAP process to increase their likelihood of securing finance from different sources. Practical guidance is also provided in subsections labelled “Key issues for consideration.” These subsections identify issues governments might want to take into consideration when assessing the appropriateness of a financing source given their needs and circumstances and when taking concrete steps toward accessing this source. Development phase, which includes actions taken to initiate, coordinate and maintain the NAP process on a continual basis. 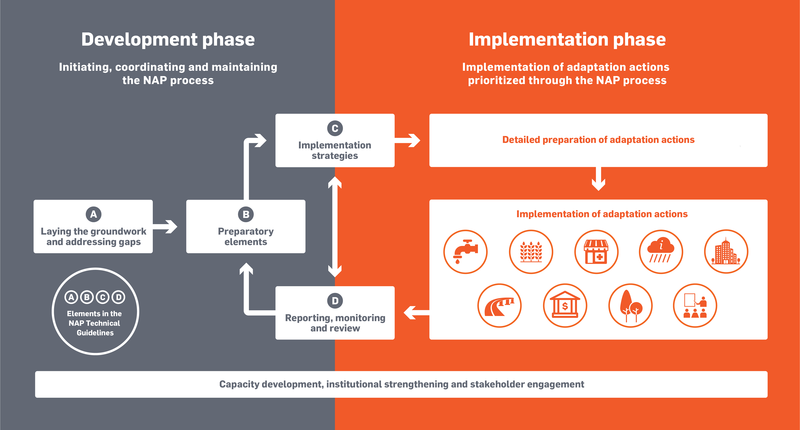 Implementation phase, which encompasses the detailed preparation and implementation of individual adaptation actions prioritized through the NAP process. Reflecting the iterative nature of the NAP process, elements of its development and implementation phases may occur (and therefore require financing) at the same time. However, the scale of financing required by these phases differs significantly. The financing needs associated with the implementation phase are significantly greater than those of the development phase. The NAP process: Key elements requiring finance. See version at the top of this article to expand. Developing countries can access a range of finance sources to support their NAP processes and thereby contribute to the achievement of the adaptation component of their NDCs. At a general level, these sources can be classified in terms of whether they are domestic or international, and public or private. A key challenge for countries is to determine how to best combine these different sources to meet their financing needs, taking into account national capacities and circumstances. For much greater detail on these potential sources of financing, please download the guidance note. Potential sources of finance for the NAP process. Identifying the financing gap given the estimated total costs of the entire NAP process in comparison to the availability of existing sources of finance to meet these costs. Determining financing options for prioritized adaptation actions by identifying potential sources of financing and suitable financial instruments, taking into consideration national circumstances, relationships and capacities. Identifying operational next steps to improve the chances of accessing the identified funding sources, such as building capacity, fostering relationships with key actors or preparing specific proposals. Through this process, a NAP financing strategy can play a key role in translating the ideas and plans emerging from the development phase of the NAP process into concrete actions taken to implement identified adaptation priorities. Main building blocks of a NAP financing strategy and its link to the NAP process. Financing needs of the NAP process should be considered from the start. NAP teams should determine the resources required for the development and implementation phases of the NAP process and how they might be accessed early in the process. The development phase should then be designed to improve a country’s potential to secure financing from these sources in the future. Engage key stakeholders early in the NAP process. Ministries responsible for finance and development planning, as well as climate-sensitive sectors, should be engaged early and throughout the NAP process. Efforts should also be made to engage bilateral providers, multilateral providers and representatives of the private sector. Investment of time and resources into these efforts will likely prove beneficial in the long term. Senior-level engagement is critical. Early and continuous political commitment to the NAP process by high-level officials from key institutions is particularly needed to promote the funding decisions that will enable its successful initiation, continuation and impact. Domestic public finance is crucial for sustainably financing the NAP process. The iterative nature of the NAP process means that financing from this source is critical to covering the continuing costs associated with coordination and maintenance of the NAP process over time. Domestic public finance is also likely to be required for investments in public goods that advance efforts to reduce climate risk, such as institutional strengthening, capacity building, and improvement of sectors such as education and health. Financing should go beyond the scope of individual projects. Given the diversity of adaptation financing needs, NAP teams should also consider financing instruments that go beyond support for individual projects and instead target programs and initiatives more broadly. Realizing the potential of private sector financing requires careful design. Engaging the private sector in the NAP process requires a clear understanding of the sector’s diversity, the motivations of its actors and how their interests intersect with countries’ adaptation priorities. This understanding can be used to identify appropriate strategies for improving a country’s investment environment for private sector involvement in adaptation actions. Countries should pursue finance sources appropriate to national circumstances and capacities. The likelihood of securing finance from different sources to support NAP processes will be influenced by factors such as countries’ general investment environments, technical capacities, public financial management systems and existing relationships with financial providers. Countries should take these factors into consideration when developing NAP financing strategies tailored to their needs. Considering the recommendations contained in this guidance can enhance the probability of securing the sufficient and dependable financing needed to initiate, coordinate and maintain the NAP process over time. It can also increase the likelihood of securing the considerable financing needed to implement prioritized adaptation actions. This financing can transform strategies and plans into concrete adaptation actions that will enable governments to reduce the risk climate change poses for its citizens, infrastructure and economies and achieve the adaptation goals articulated in their NDCs. Read a summary and presentations from the NAP Global Network's Targeted Topics Forum on “Financing NAP Processes: Options for Implementation” held in June 2017.